Wishing you a Regenerative Winter Solstice and Deeply Nourishing Holiday Season! This photo above is one of my family morning swim in Coffs Harbour, NSW Australia where I am right now. Being here is like coming back to my roots. We swim, we eat, we be with each other and I marvel at how much the kids have grown every year as if it was not expected. Wishing you a deeply receptive and yin Winter Solstice tonight, or here downunder where I am right now – Summer Solstice. I thought this a good time to share with you about the benefit of observing the cycles and seasonal fluctuations around us and how the Winter Solstice can benefit your transformation practice right now. For those of us who live in the Northern hemisphere, this is the most yin or receptive time of the year. Remember that yin and yang always exist, they are just fluctuations or change of state of energy that happen all the time. So in any one day there are times which are more yang or more yin. We need both. Noon could be seen as the most yang time of the day. If you were in the yang state at noon, it would be when your energy was engaged in action, the Sun at its highest point, you would be actively putting energy out into the world around you. Midnight would be the most yin time of the 24-hour day. In the yin state you would be deeply internalized, potentially sleeping, being nourished, traveling through far away dream spaces, receiving inspiration. As I said, there are also times of the year which are more yang, or more yin. And for those in the Winter Solstice today, it is the depths of the yin time in the cycle. Reaching the highest point in spiritual worlds relates to what is referred to in the Clairvision Knowledge Track Death the Great Journey as ‘the journey to the Archetype’. This is a time to go inside. To let go. To connect with your deepest self and allow the external to drop away. If you are anything like me, the practice of letting go can be difficult especially after a long year of lots of action. So in this time off, allow that emotions might come up, and that you might feel driven to act even though you are giving yourself at least a few days off work. Just be with that desire to act but do not feel you have to do it, just be with it. In any letting go there can be grief, joy, loss, anger, love or any feelings come up. Do not make those feelings about what is happening around you, but see them for what they are: part of the release and unraveling of the whole year. 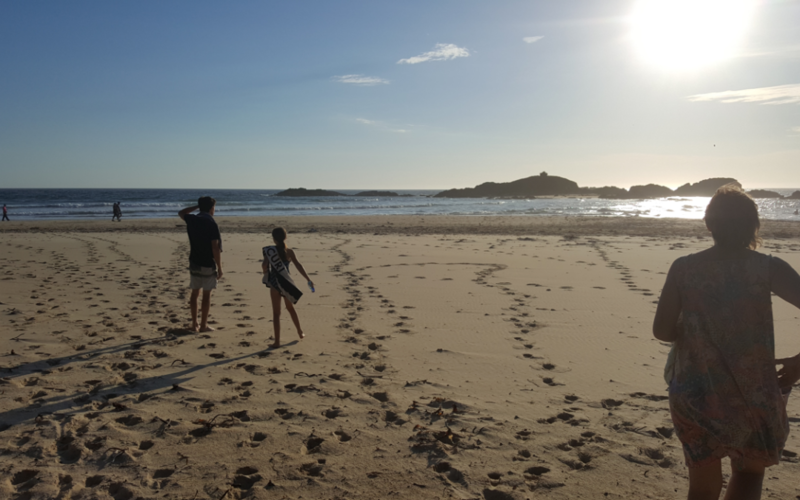 For me the beach, the family time, the return to Australia allows this letting go. The Sea is all receptivity, an embodiment of yin power. My family is my roots, my depths, my origin. And Australia is where I grew up, it makes me feel my own sunny heart. For you, there might be different things that trigger the yin state and promote the deep letting go. Water, rest, internalization, meditation, quiet, time alone or with a few loved ones, time out, are some of the things which might help you. Anything that promotes reflection, rest, spreading your energy, and flow. As of December 25th, I will also go into retreat until January 13th. Meditating at a retreat center in rural NSW. This will be an even deeper dive. Let’s be honest with ourselves, even just on the global political front, let alone at home and in your own heart, it has been a big year. Things have not been easy and they may not get easier. Allow this to flow through you, so that you can be refreshed and renewed for a clean start next year. The benefit of a real letting go right now will show later after the New Year, possibly closer to Spring. So do not get caught in the trap of looking for an outcome or a result. Just be with what is right now. Receptivity is also the part of yin power. To practice receptivity can be challenging, but an easy way to do that is to acknowledge your blessings. Notice what you have achieved, what has changed in your life, and feel the gratitude for that. What I see in myself and clients is that receptivity is really difficult in our action orientated world. Receptivity is simple, and an active non doing. It is enjoying, appreciating, giving thanks for the things that make your life special. The people who have given to you, the things that you have done for yourself, the beauty around you even right now. Our current social and cultural expectations are for people to be in the more yang or active state almost all the time. The more yin way of being is not valued in our culture at this time. Yet yin states are extremely valuable and powerful. In fact, you cannot have one without the other. If people do not go into receptive restful states at any time during the day, they become fatigued, drained and unable to be in full action let alone receive at all. In short – how do you make the most of the this time of year? Appreciate what you did last year, Let go of what you lost. And allow yourself time to connect with your own depths. p.s. 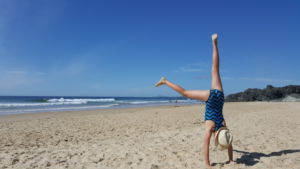 here is my dearest niece Arlia practicing cartwheels in expression of the joy of life!